According to Wikipedia, the red-capped manakin is probably best known for its unusual courting method whereby it shuffles rapidly backwards across a branch, akin to a speedy moonwalk. The male manakin has a distinctive with its bright red head and nape and velvety black bottom whereas the female are characterized with feathers that are olive green above, with paler, more yellow-green underparts. The male manakin doing the epic moonwalk. Featured in World's Weirdest by NatGeoWild, the video below is of a red-capped manakin as it engages in competitive displays that may entice visiting females who are surveying prospective partners for copulation in a gathering called a lek. 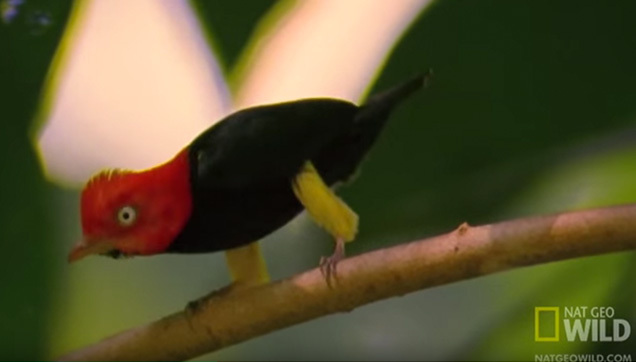 Watch the red-capped manakin as it tries to impress the ladies with its entertaining snazzy steps!